Rudolph J. Vecoli, author of 'The People of New Jersey,' began his definitive ethnic study of New Jersey with a review of the French Huguenots, the German Buskirks, and the Polish Zabriskies at the time of the Revolutionary War era, just as New Jersey was becoming a modern state. While these early examples of different ethnic families are interesting, in the case of the Poles one must stand back to see their overall and long-range immigration patterns to America, New Jersey and Newark, and to appreciate their accomplishments. According to Dr. Charles Baretski, a noted student of Newark's Polish community, settlement began even earlier than the last quarter of the 19th century. To Baretski, Newark Poles represented a significant number of the 'new immigrants' who brought with them to America their own institutions—religious and secular. In addition to the Zabriskie family of colonial times, Baretski points to Julian Niemcewicz who lived in Elizabethtown, married into the well-known Kean family and took citizenship in Newark. By the close of the 1840s Abraham G. Zabriskie was practicing law in Newark. Just as importantly, a Polish community began taking shaping in Newark over a century ago along High Street and on South Orange Avenue. Baretski found that Newark's newly arrived Polish-Americans arrived in this country from the 1870s to the turn of this century, gravitating not only to Newark, but also to Jersey City, Paterson, Camden, Trenton, Elizabeth and Bayonne. Baretski argued that early census accounts are inaccurate for a variety of reasons and considered Catholic church records far more accurate. His claim is based also on records of numerous social organizations and the establishment of Newark's first Catholic parish of St. Stanislaus in 1889 by the Rev. John Machinowski. Vecoli's research showed that Polish immigrants arrived in Newark a little later than Baretski's findings, about the same time as other new immigrant groups that included Italians and Hungarians. Many of New Jersey's older cities soon assumed a more cosmopolitan feeling because people from so many foreign lands lived there. This was especially true in Perth Amboy, Bayonne, Paterson, Elizabeth and Newark, where 30 percent of the population was now foreign born. While Newark did not have a section called New Warsaw, the Polish influence was as much felt along South Orange and Belmont avenues and along Pulaski Street in the Ironbound as in the Budapest section of Perth Amboy and the Dardanelles section of West Hoboken. By the beginning of the 20th century, Newark's new immigrants and especially the Poles, had replaced many of its older immigrants in the nastiest jobs, in the worst neighborhoods, and under the least favorable conditions. The stage was again set for the Americanization process to begin all over again in what was seen by some as the continued emergence of an American nation. It's impossible to list Newark Polish-American leaders for fear of omitting a significant name and hurting somebody's feelings. So think of this enumeration as simply a sampling of past newspaper accounts of some of those who have helped others or are fondly remembered. Peter Wujciak was a coal dealer who is credited with Walter Loboda as having built one of the first apartment houses in the Ironbound about 1900. In 1906, Joseph Zeger left Austria after deciding not to serve in the army and came directly to Newark where he found work in a local leather tannery and saved enough money to marry and raise his family here. In 1908, the Rev. Julius Manteuffel was appointed pastor of St. Casimir's parish. He celebrated his first Mass in St. Benedict's School Hall on Sept. 6, his first baptism on Sept. 20, and a first marriage on Oct. 5. Soon land was purchased on Tyler (Pulaski) Street at Nichols and East Kinney for the building that was to become the original church and school. In 1912, he was transferred to a parish in Passaic. In 1909, Mr. and Mrs. Joseph Macek arrived from Poland, were married at St. Casimir's, and went to Hamburg Place School to learn English at night. Mrs. Macek had worked in Warsaw for 25 cents a day. In the Ironbound, she was paid $3.50 for rolling cigars in a Union Street shop. Later the couple operated a delicatessen on Walnut Street and a butcher shop on Pulaski Street before entering the tavern business. Rev. Paul Knappeck, who succeeded Father Manteuffel as pastor of St. Casimir' s in 1912, added a third floor to the convent and developed plans for a permanent church building which was completed in June 1920. In 1924, a new school was built. In 1926, murals and frescoes were added depicting the Life of Christ and St. Casimir. Extensive clubroom facilities were added for the parish youth in the sanctuary's undercroft. Msgr. Knappeck was honored by Pope Pius XII in 1954. He passed away in 1964. Also in 1912, Mary Smetkiewicz left Poland. Eventually, she brought her two sisters to Newark where she raised her four sons – one a graduate mechanical engineer, one a medical student, and two graduates of the Naval Academy at Annapolis. Reflecting on earl Polish life, a charming reminiscence by John Robert Swicinski in 1993, 'A Newark Trilogy. Childhood Memories,' includes three stories—'Bachi and the Capture of the Burglar, ' 'The Planting of Rosie's Bean Garden, ' and 'Uncle's Sunday Afternoon Auto Accident in the Country.' All three portray family values of an earlier, innocent era. The church and the club are focal points around which Newark's Polonian neighborhood centers. Church origins can be traced to 1880 when the first Polish immigrants settled 'On the Hill' near Belmont and South Orange avenues. In 1888, a church group began holding meetings at St. Mary's School on William Street. Soon a committee was formed to approach Bishop Wigger to request a parish for Newark's Polish-speaking Catholics. On Oct. 20, 1889, St. Stanislaus parish was established with the Rev. John Machinowski as first pastor. The first Mass was celebrated in September 1890. Various pastors ministered to the church, but it was Rev. Vitus J. Masnicki who bought land, built a school, established the convent, and brought the Felician Sisters to the parish school in 1899. Father Masnicki was later transferred to Elizabeth and was followed by Rev. Olsaewski. The Rev. Adalbert F. Kiczek became pastor in 1948 and remained at St. Stanislaus until he became pastor at St. Casimir's. He paid off the mortgage, and made extensive renovations to both the church and school. The growth of Newark's Polish Catholics was not limited to a single location. Rev. Vitus Masnicki was instrumental in purchasing land for the creation of a second Polish parish. In December, St. Stanislaus' congregation paid $6,600 for the Tyler (now Pulaski) Street property, which became the home of St. Casimir's. In repayment, St. Stanislaus accepted only $5000 from its sister parish. Almost a mile apart from steeple to steeple, a strong emotional bond ties the two churches together. With the land purchased for a second Polish Roman Catholic parish in the Ironbound at Pulaski Street, Father Manteuffel proposed that St. Casimir be selected patron saint of the new parish. The first child baptized at St. Casimir's was Michael Cwiakata on September 8, 1908. The first marriage united Simon Patecki and Marcella Poliwczak on October 5, 1908. Soon the blueprint for both church and school were drawn and construction began at a cost of $35,412. Reaction to the plans were mixed, and so in 1917, designs were completed a new $190,000 church building. The cost was $115,000 for the exterior and $75,000 for the interior. At a parish meeting members agreed to be assessed $25 each. But completion of the plans was delayed by the outbreak of World War I. Nevertheless, a house-to-house collection raised $90,000. On October 8, 1917, solemn vespers and groundbreaking for the new church was joyfully celebrated. The following June the exterior was completed. This was followed by the installation of the altars, a pulpit, organ, bells, pews, altar rails and confessionals. An additional $70,000 was obtained and more property was purchased along East Kinney Street for a school playground and convent. 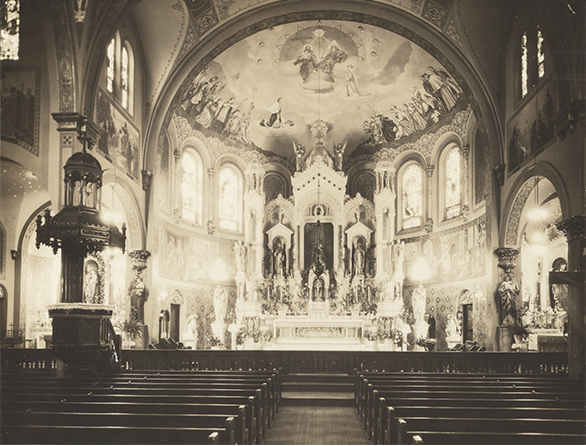 In June 1920, it was reported, 'An overflowing crowd of faithful from Newark and nearby cities came to see and marvel at the splendor of the largest Polish Church in the Diocese of Newark.' Almost immediately, plans were laid for a new school building with 18 rooms and an enrollment capacity of 2,000. St. Casimir's, known locally as 'The Basilica of the Ironbound,' is the great Newark monument to its Polish Americans. It is one of the city's largest houses of worship, and is indicative of the quality of early 20th century church architecture in Newark, according to Ulana Zakalak, who prepared its successful nomination for entry on the National Register of Historic Places. St. Casimir's is situated away from the Ironbound's bustling Ferry and Lafayette streets in the middle of a residential area. Bounded by Pulaski, East Kinney, and Nichols streets, just south of East Side High School, its distinctive twin towers are a neighborhood landmark. A beautifully detailed architectural description of the building exists in the Zakalak nomination, available at the Newark Public Library's New Jersey Information Center. Completed in 1918 the Romanesque Revival style edifice of yellow brick is trimmed in glazed terra cotta. The richly decorated interior contains fine German-crafted stained glass windows of heavy blues and reds. The church seats approximately 2,300, and its high altar is perhaps the most elaborate of any church in Newark—three stories high, divided into five bays, and constructed of masonry, plaster, and wood with marble and inlaid mosaic statues and portraits. The portrait of St. Casimir is operated on a pulley system and can be interchanged with a jeweled portrait of Our Lady of Czestochowa. The side chapels are dedicated to the Blessed Virgin Mary and the Sacred Heart of Jesus and are enhanced by rose windows above. Halfway down the nave is the baptismal font. Sixty stained glass windows by Ludwig VonGerichten of Munich were installed in 1919. A painted ribbon on the wall below the St. Casimir window proudly proclaims 'Polonia Semper Fidelis.' Stations of the cross line the interior walls, and each of the great window bays is dedicated to an important Polish city. The choir loft is in the rear. The Rodzewicz organ was built in Millburn and installed in 1918. In 1936, a serious fire severely damaged the building's interior. Again, in 1998 it narrowly missed total destruction in a gas explosion, but a modern-day miracle saved the structure. St. Casimir's marked its 90th anniversary last year with its inclusion on the National Register of Historic Places. It remains one of Newark's most beautiful houses of worship with its western- style statuary, a place to visit and to admire. Polish life in the Ironbound was influenced also by many organizations and self-help groups. Founded in 1888, the Polish Falcons has national headquarters in Pittsburgh. The organization is divided into districts, which are in turn subdivided into lodges called nests. The District for New Jersey and New York has headquarters in Somerville, Hillsborough Township, near Princeton on about 100 acres. The property includes several buildings, camp barracks, a chapel, mess hall, picnic grounds, swimming pools, a dance hall and other types of other recreational facilities. There are two nests in Newark. Nest No. 104, which operated out of several buildings and lots at 280 New York Avenue was recently sold, and is now headquartered at St. Casimir's Church. Nest No. 17 is the Cuptown Newark agency on South 20th Street near Springfield Avenue. Other groups include the Polish Education Club of Newark formed in 1919 to prepare incoming immigrants for an active life in the American community. The Polish University Club of New Jersey was founded by Dr. Edward A. Bogdan. In 1931, a Women's Auxiliary was begun. The Polish Arts Club of Newark included both men and women and followed the demise of the Polish Contemporary Club. The Institute of Polish Culture at Seton Hall was organized to offer a wide variety of cultural and educational programs for the state's Polish population in a more formal setting. Dr. Charles A. Baretski was instrumental in its founding. Gradually many of these agencies tended to move to the suburbs. Before St. Leo's Church was established in Irvington, Polish residents of that community attended the two Newark Catholic parishes. A recent newspaper article noted that few if any children speak Polish at St. Casimir's School, in part because many Polish people have moved to suburbia. It went on to state that despite the 'move out,' Polish traditions in the Ironbound remain strong. For example, the devotion to Our Lady of Czestochowa, the celebration of Holy Saturday, the tradition of blessing Easter foods—the ham, kielbasa, colored eggs, mushrooms, cheese, butter and babka—remain as strong as in years past. The participation of Newark residents in the New York City Pulaski Day Parade also remains constant. Baretski perhaps sums up the condition of Newark Poles this way: 'They have fashioned a massive and enduring citadel of self-help, mutual benefit societies and a network of cultural conduits.' A century after settling in Newark, he concluded, their descendants still constitute one of the state's largest ethnic minority groups.